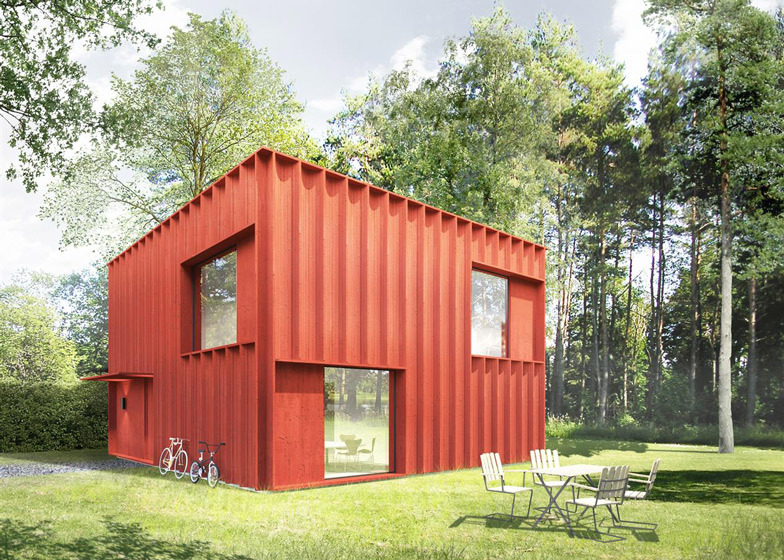 Tham & Videgård draws up designs for "Sweden's statistically most sought-after home"
Swedish firm Tham & Videgård has attempted to design Sweden's most desired house – a mash-up of the nation's traditional red-painted timber cottages and a functional box. Architects Bolle Tham and Martin Videgård – whose past projects include a mirrored treehouse – were commissioned by property agency Hemnet to design "Sweden's statistically most sought-after home". The architects came up with The Hemnet Home – "a new typehouse for everyone by everyone" – after measuring the popularity of the agency's 86,000 online property adverts, which was calculated through 200 million user clicks. They combined the two most-searched for archetypes – the traditional timber-clad cottage and the functional white box – to create an ideal house, envisioned as a red timber cube with an enclosed terrace and generously sized windows. "A home built by two million Swedes, the Hemnet Home is a data experiment to lead the way for a new type of architecture," said Tham and Videgård. "A direct interpretation of statistics from all the Hemnet users gave an average value that determined the measurable properties of the home including size, price, number of rooms, bathrooms and floors." "The aim was to create an architecture that combines the statistics with the features of the two iconic types – the rationality of the functionalistic box combined with the quality of craftsmanship and material presence of the Falu red cottage," added the architects. Curving channels cut in the Falu red cladding – a vibrant red wood stain and preservative typically used on Scandinavian buildings – give the facade a wavy texture of hollows and ridges. Translating the common desire for an open-plan kitchen and dining area, the architects planned a double-height kitchen as the focal point of the hypothetical property. Panels of floor-to-ceiling glazing and an atrium draw on the ambition for light-filled interiors, while a partially enclosed terrace provides a sought-after space for dining and entertaining. "A terrace is inscribed within the cube and thus provides a sunny terrace protected from the wind and also offering privacy," explained the architects. "This is beneficial, particularly for denser housing areas." Abundant storage would be built into a entrance hall fronted by a traditional porch, while more unusual details include a bathroom covered with hexagonal tiles and a porthole-shaped skylight. The fictitious 120-square-metre property is priced €300,000, which is approximately £215,000. Team: Martin Videgård, Bolle Tham, Johannes Brattgård.